Beware, the so-called ‘Momo Challenge’ is deadlier than you think. CURB THE CHALLENGE. The Japanese sculpture ‘Mother-Bird’ by Keisuke Aisawa has become the icon of the Momo online ‘suicide game.’ The death of an 11-year-old boy from Quezon City, whose was influenced by the online challenge, prompted authorities to warn parents against the game. 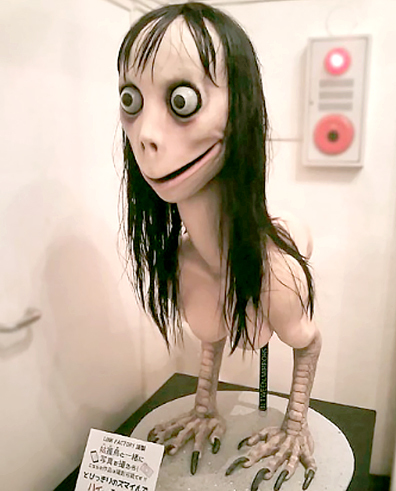 Described by concerned netizens as a ‘suicide app,’ Momo Challenge is the subject of an advisory by lawmen and IT experts, an online application targeting young Internet users, and ‘encouraging’ them to commit suicide. In a statement, the Department of Information and Communication Technology has urged parents to monitor the online activities of their children following the reported ‘online epidemic’ caused by an application of unknown origin that invites young users to do horrific tasks with suicide as the ultimate challenge. The application called ‘Momo Challenge’ allegedly led 11-year-old Chlyv Jasper “CJ” Santos to commit suicide. Santos was buried on Tuesday after being sent to a hospital’s intensive care unit due to drug overdose. Paula later learned that CJ had a classmate who hurt himself in school. She then found messages in his son’s mobile phone. The DICT, meanwhile, cited a concerned citizen named Joy Alburo who noted on Facebook that the application may pop up in the middle of random videos on Youtube and attract users to engage. But how does Momo Challenge works? Momo is a doll figure with bulging eyes and a gaping mouth. In other developments, regulators claimed that they do not have jurisdiction over a messaging app used in the deadly “Momo Challenge” that has been blamed for CJ Santos; death, the DICT said.